A painting by Archibald J. Motley Jr. of Chicago's Bronzeville neighborhood lit by moonlight and incandescent street lights. 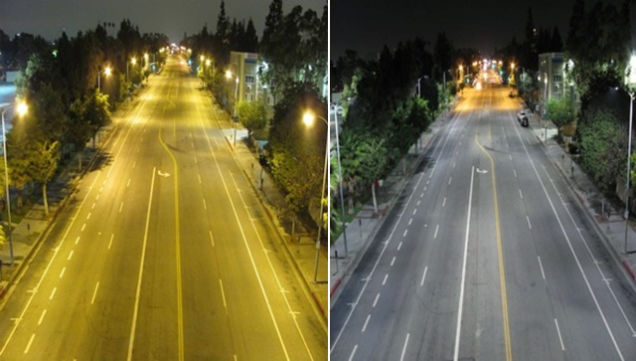 An example of the color differences in sodium vapor lighting, left, versus LED lighting, right, on a residential street in Los Angeles. Audrey Fischer, President of Chicago's Astronomical Society. The Chicago sky as it could be without light pollution showing the Milky Way and numerous stars. On a clear night in the summer of 2014, Mike Mesterharm hopped in his car and hit a southbound expressway toward downtown Chicago. He was happy to be back home; he’d left the city at 18, for college and some other shenanigans. 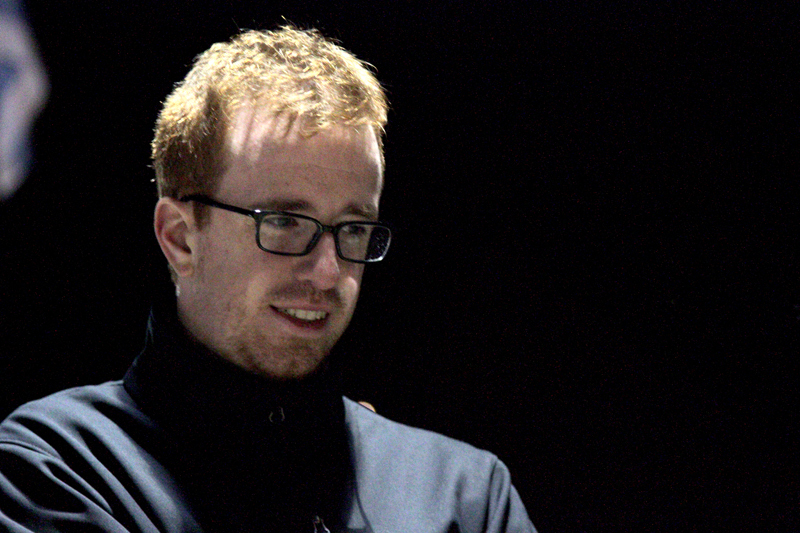 During that drive, eight years later, he was gazing at the Chicago skyline — his skyline. And he was thinking it looked different somehow. Brighter. How has energy efficient lighting affected the view of the Chicago skyline? We found an answer for Mike, but the “green energy angle” is just a part of it. Expert after expert suggested that that story would not do justice to the big picture: Chicago’s skyline’s evolved over the years, and that Mike’s question is born from a short snippet of that fascinating history, one that has affected how we see — and feel — one evening to the next. We’ll run through the highlights of how that’s been captured in art, of all places, and deal with Mike’s question in the most recent timeframe. And at the end of it all, we arrive at a crossroads that illuminates a big decision we’ll soon have to make: What does Chicago want its skyline to look like? The impact of city lights on city dwellers has affected Chicago’s culture, too; to get the broad picture of change in the skyline, you can survey the city’s literature and visual art. Note the skyline’s yellow tinge in this excerpt from ‘The Windy City’ [sections 1 and 6], penned by Chicago poet Carl Sandburg in 1916. Singing a soft moaning song: I am a child, a belonging. Compare that to the light-polluted sky found in this excerpt from ‘The Waste Land’ (2010) by John Beer. Orpheus walked down Milwaukee Avenue toward the Flatiron Building. He passed bodegas, taquerias, vintage stores. He met a hustler with a gas can. He walked past the anarchist kids. And he walked, and he walked, and he walked past the cabdrivers trading insults in Urdu, and he walked past convenience stores, and he walked past Latin Kings, and he walked past waitresses getting off night shifts, and he walked past jazz stars that nobody recognized, he walked past the students, the teachers, the cops. And the sky was the color of eggplant and tire fires, the sky was the field that resisted exhaustion. 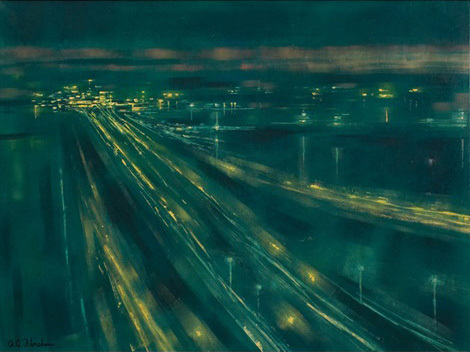 Lynne Warren, a curator at Chicago’s Museum of Contemporary Art, says you can track Chicago’s changing city lights in paintings, too. 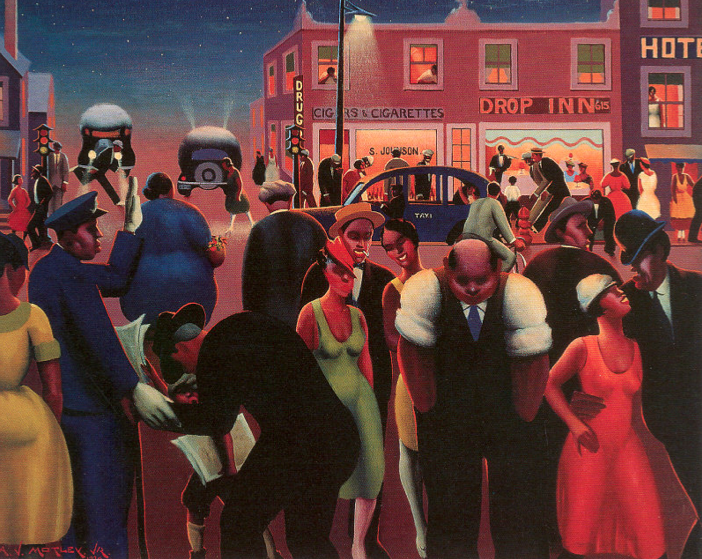 In Bronzeville At Night (1949), Chicago artist Archibald Motley depicted the yellow incandescent street lights used across the city at the time. The lamps were sparse and dim enough that on clear nights, you could make out stars across the skyline. Warren notes, too, that the warmth of incandescent light enhanced the “natural” colors of Chicago’s nightscapes. For example, the red of the classic, Chicago brick on the building in the background is actually drawn out by the light. The tops of the cars on the left also reflect the “truer blue” of the Chicago night sky. A decade or so after Motley’s Bronzeville painting was complete, though, the city swapped out incandescents for brighter bulbs that gave off a green cast. The 1960s were the era of mercury vapor lights, and, by some accounts, they cast a sci-fi feel across the city. By the end of the 1970s, just about all of Chicago’s streetlights were replaced yet again, but this time with sodium vapor lights, which glow with a deep orange. Or, like orbs the color of tire fires, if you will. Chicago’s still got a lot of these lamps, and they dominated the city during the &apos;90s, when our question-asker, Mike Mesterharm, was a kid. 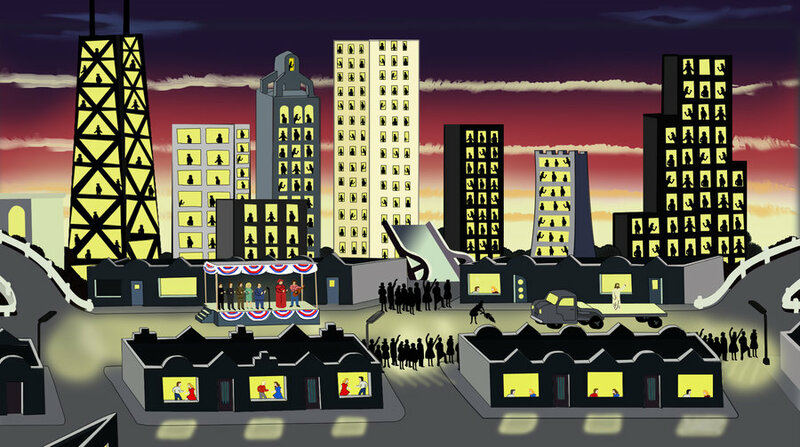 Warren says that gold glow repeats over and over in depictions of Chicago’s skyline by Roger Brown, an influential painter during the Chicago Imagists movement. His piece Entry of Christ into Chicago in 1976 (1976) depicts the Hancock Tower, the Aon Center and the Sears Tower (today’s Willis Tower) being set against a light-polluted, sodium vapor sky. All that’s to say, Mike Mesterharm’s question comes at a bit of a well-lit crossroads; recent changes to Chicago’s lit environment are again affecting its color palette. Warren says she’s beginning to consider Brown’s work as historical — like she would Edward Hopper’s Nighthawks or Motley’s Bronzeville At Night — because, like Mike, she’s noticed the gradual visual exodus of the sodium vapor light. George Malek, director of ComEd’s energy efficiency program, confirms sodium vapor lighting — and its tell-tale gold glow — is on its way out. And, he says, the transformation is driven by a city-wide movement toward efficient lighting, something that Mike had suspected when he pitched us his question. Malek says during the ‘90s, manufacturers and engineers developed ways to wring the same amount of light (if not more of it) from the same amount of power. The improvements, he says, came with indoor fluorescent lights used in office buildings and commercial businesses. Previously, fluorescents ran on magnetic ballasts (the things that make a lamp turn on), but newer, electronic ballasts could run on 60 percent of the energy previously needed. Over time, Malek says, the standard width of fluorescent tubes got thinner and thinner, but they emitted more and more light. With these successes in hand, Malek says, companies like ComEd saw potential for energy efficiency on a larger scale. In 2008 ComEd launched a series of initiatives to help businesses and residents cut their energy consumption — and costs — across the board. Malek says the vast majority of requests from commercial businesses were for replacing lighting systems. He says that’s still the case. Malek thinks our question-asker, Mike Mesterharm, is on to something when it comes to the Chicago skyline getting brighter. Malek points out, though, that while the skyline’s getting brighter in terms of lumens (a measurement of visible light), it’s also getting brighter where you actually need it to be bright. That’s because of the increasing accessibility of Light Emitting Diodes (LEDs), a lighting technology that’s more directional and brighter than their sodium vapor predecessors. LEDs are also “cooler” on the color spectrum than sodium vapor lights, so they give off a bluer hue, unless they’re somehow manipulated. Advancements in LED color rendering are happening quickly, though, Malek points out. So while the skyline may be brighter overall because of them, it’s hard to predict long-term changes in the skyline’s color. Malek can’t say for sure whether Chicago will adopt the same fixture technology, but he predicts it will arrive someday, regardless of energy savings. And if you think that’s going to change the view of a skyline, we’ve only scratched the surface. Light as a utility is one thing, but light as an aesthetic or artistic choice is another. And as LED technology swarms the light market, Chicago, like other cities, will have more choices about what kind of lights to buy and how to use them. That’s true for your home, your neighborhood, and the entire Chicago skyline. Changes in the skyline could be hard to ignore. Take what’s happened at the Intercontinental Miami. In 2013 the hotel installed a 19-story LED installation of a silhouetted woman dancing on the side of its building (and then offered this explanation). The 47-floor iconic Miami Tower in the heart of downtown is now also a slate for light displays that look like neon fish — with the capability of 16 million color combinations. Schuler Shook lighting designer Jim Baney points out that LEDs can be used in subtle ways, but he’s seen projects get carried away, too. From his vantage, lighting in Chicago should accompany presentation of architecture. With this much power in our hands to light the world as much as we want (and however we want), there is a case to made for a different strategy for Chicago’s future skyline: restraint. 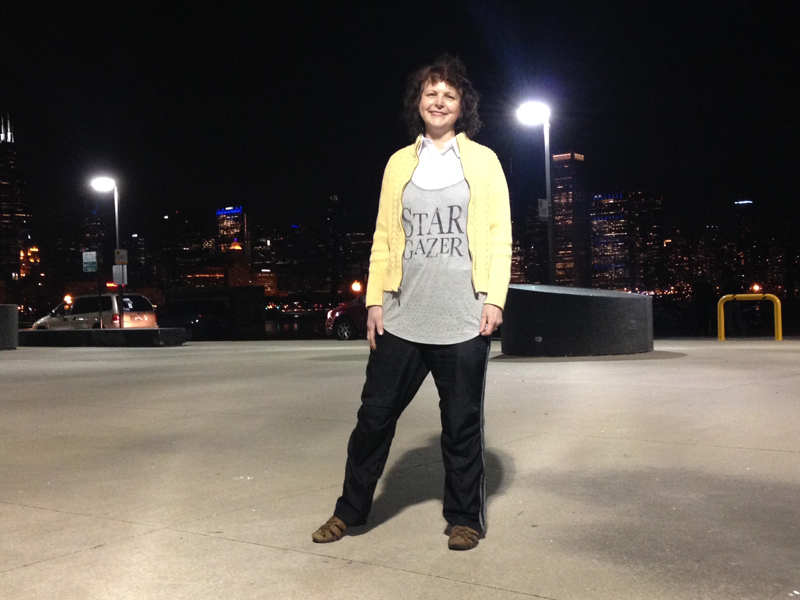 Audrey Fischer, President of Chicago’s Astronomical Society and an advocate for dark skies, wants the city to invest in light fixtures that only shine downward, and bulbs that don’t burn quite so bright, or so blue. “In my mind a ‘green’ city like Chicago ... ought to have a midnight blue sky, star-studded with the milky way,” she says. If the case for starlight’s natural beauty doesn’t move you, Fischer points to a litany of problems associated with irresponsible lighting (aka, light pollution). For starters, it screws up bird migratory paths and disrupts roosting by local bat populations. Even the eco-friendliest of lights can screw up our own internal clocks as well. And that’s apart from evidence that the wrong lighting can increase the risk of breast cancer, obesity, and sleep disorders. (For an extensive look on issues regarding blue-rich, white outdoor lighting, see this report by the International Dark-Sky Association). Fischer says Chicago is the most light-polluted city in the world, referencing a study by researcher Harald Stark at the University of Colorado. This is kind of ironic, given that in the early 20th century Edwin Hubble (of Hubble telescope fame) made some of his most important scientific discoveries (like the fact that the universe is expanding) with a degree in mathematics and astronomy from the University of Chicago. Now, you can hardly even see starlight if you&apos;re gazing within the city limits. A study by the National Park Service estimates that by 2025, dark skies will be an “extinct phenomena” in the continental United States due to light pollution. To people like Fischer, that’s a pretty high cost. Here’s a taste of what we’re missing. Mike Mesterharm is from Chicago, but he left the city at 18 to attend college. He says he didn’t pay much attention to things like street lights or skyline changes. But come to think of it, he says, he didn’t pay much attention to anything at 18. Now, at 28, Mike says he’s a bit more observant about his environment. In fact, he says his whole concept of the environment has expanded. “Our environment isn’t simply the hard matter,” Mike says. “It’s the things that exist around that. It’s the light, it’s the sound. Logan Jaffe is Curious City’s multimedia producer. Follow her on twitter @loganjaffe.